The sunshine is great news for our winemaking client Polgoon as they are anticipating a vintage year following the recent spell of hot weather. The award-winning Polgoon vineyard near Penzance in Cornwall is reporting their best ever year so far as the prolonged sunshine provides near-perfect growing conditions. Now owners Kim and John Coulson are hoping the mini-heatwave will carry on for the next few weeks, helping them to produce a bumper crop. “For the first time in seven years this is the perfect weather for the vines. Each variety is moving through flowering in to fruit set with ease,” said Kim. “As long as the beautiful Cornish sunshine continues we are looking at vintage 2013 being both top quality and quantity,” she added. Polgoon vineyard, situated on the south facing slopes overlooking Penzance and St Michaels Mount, provides the perfect location for growing grapevines and apple trees. Seven years ago Kim and John were fish merchants supplying Marks & Spencer from their business based at Newlyn. With a growing family of five children they needed a bigger house. By chance they found a derelict farmhouse on the edge of Penzance and decided to buy it – along with 23 acres, two cottages and two barns for conversion. 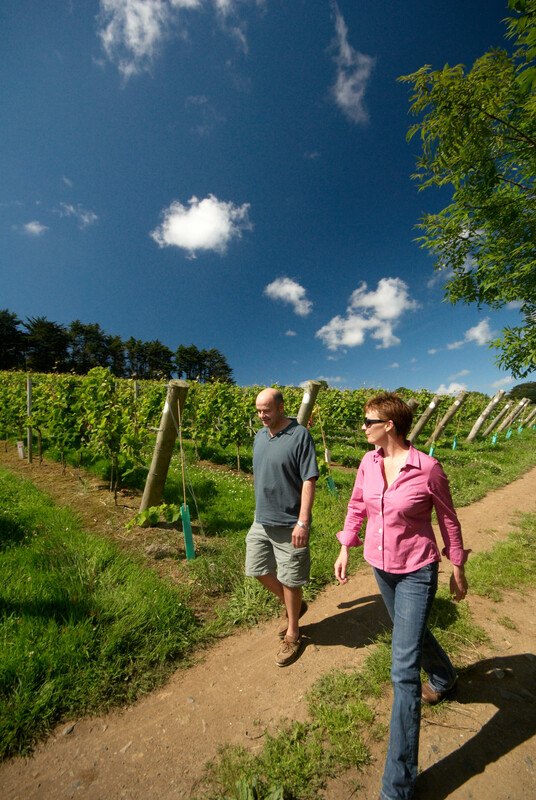 After meeting an award winning Cornish Wine maker they decided to plant vines and create their own Cornish Vineyard. From their first wine harvest (2006) they were awarded the Trophy for the ‘Best Still Rose in the UK’ by the UK Vintners Association. The next two yields of Polgoon wine also won major national competitions. Due to adverse weather conditions, Polgoon suffered terrible harvests in 2007 and 2008. Determined not to be beaten the Coulsons perfected a sparkling Cornish Cider called Aval – Cornish for apple. The next product of Polgoon Vineyard was Aval Raspberry which won a gold medal in the Taste of the West awards 2009 and was runner up in the National Drinks Awards. The summer of 2009 was a good one for growing and Polgoon had a strong harvest, making for an excellent vintage. Most recently they have launched a Perry called Peren – Cornish for pear.